cement contractors – Concrete Contractors, Concrete Construction, Concrete Paving | Bernardo Concrete Inc. If done correctly, concrete sidewalks could last 20 to 40 years. However, there are many factors that can limit the lifespan of concrete. Here are a few tips to getting the best product possible. Tip #1 Hire a reputable concrete contractor. Do your research. Make sure you have an idea of what you want before you contact any contractors. Look up several local concrete contractors and give them a call. Pay attention to how long it takes them to respond to your call. Get written estimates and compare apples to apples on several bids. Call references and check on licensing and insurance. If you are lucky enough to be putting in new concrete sidewalks, you may have a choice of where you put them. If, for example you are putting them throughout a business park, you may have the option of keeping them away from trees. Tree roots are the enemy of concrete sidewalks! If you choose to locate trees near the sidewalk, choose smaller trees or a deep rooted variety. If you have to locate your concrete sidewalk near existing trees, know that you may have to repair the sidewalks periodically due to root lift. Cutting the root that is lifting the concrete may damage the tree or make it less stable. Your concrete contractor should be able to help you select the optimal path for your concrete sidewalk. Once you have chosen a concrete contractor, speak with them about the process. Quality of construction is an important factor in the longevity of your concrete sidewalks. There is such a thing as different strengths of concrete. Make sure your concrete contractor is using the proper strength for your job. Know what type of preparation of the sub grade your concrete contractor is planning to use. Sometimes the concrete can be poured directly on your ground or you may require base fill and steel rebar installed in the slab. To help minimize cracking, find out if there are any special curing instructions. This can greatly depend on the weather at the time of pouring. Last, but not least, ensure that there are proper control joints. These should be 4 feet apart across the width of the sidewalk and about one quarter of the slab thickness. 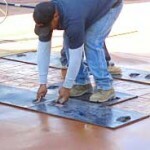 Proper installation and quality products are key factors in concrete sidewalk installation. When done properly, concrete sidewalks can last for years. However, it is not unheard of for concrete to fail. Choosing a good concrete contractor is the most important factor for a smooth project that you will be enjoying for years.